Suitable for small, medium and large sized buildings. Do you have evacuation diagrams located at strategic points in your building? These are an essential part of your evacuation procedure and are required by Work Health and Safety legislation. 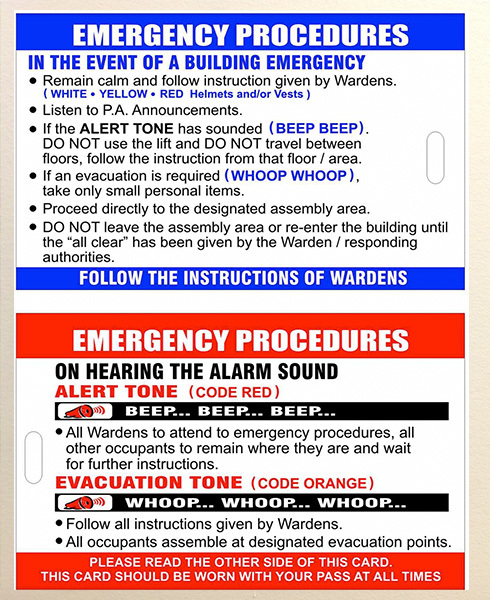 We can design your emergency evacuation diagrams using our special software. Finally we prepare laminated wall diagrams (framed) for each specific location in your building. * We will frame and fit the diagrams to building walls so they are more aesthetically appealing and also they have a better idea of what type of frame and colour they want. Price is subject to size and height. Emergency response flip charts are an effective way of referencing important contacts and actions to be taken in an emergency. An emergency flip chart is a handy document that can be positioned in clear easily accessed positions throughout your building, warehouse, factory or place of business. Fire Direct has created a specialised poster with information on what to do in the event of and emergency, including what the emergency warning sounds will be, and what to do when you hear them. It also includes valuable information about evacuation procedures and alerting emergency services. Emergency response posters are a great way of providing easy to access information which are be important in an emergency. 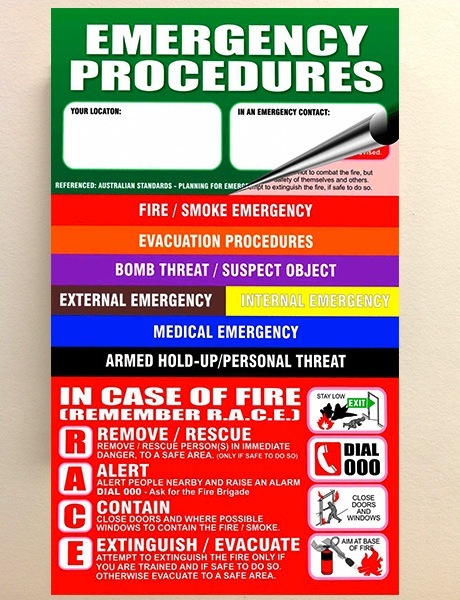 An emergency procedures poster easy to follow and can be positioned in clear easily accessed positions throughout your building, warehouse, factory or place of business. During and emergency, it is important that members of the workplace emergency team are easy to identify. 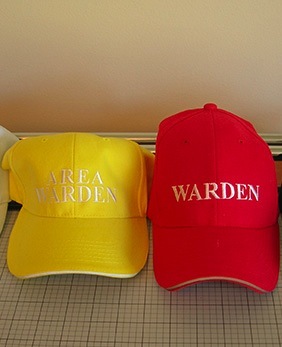 Fire Direct has made this easy by providing distinctly coloured hats and lanyards with the role embroidered on the front for easy recognition. 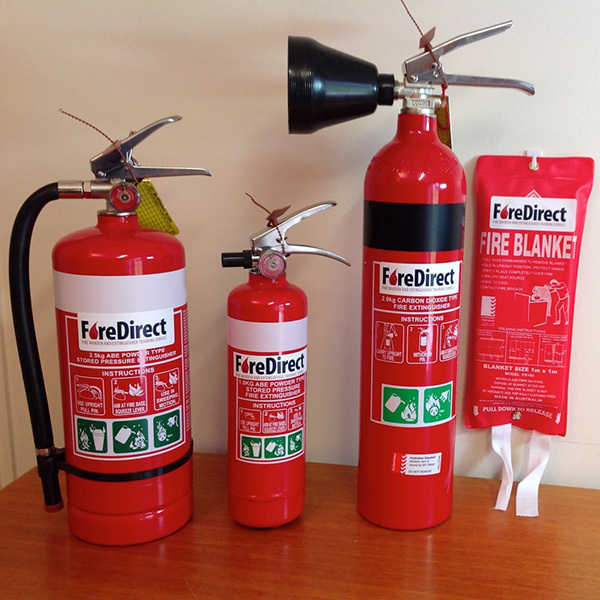 CO2 Fire Extinguisher range from 2.0kg, 3.5kg & 5.0kg size. Air/Water Type Extinguisher 9.0 litres. We also carry a Mobile Range of firefighting equipment from 22kg through to 90 kg size and from 30 litres up to 90 litres. Fire Hose Reel: 36 Metre x 19mm Hose certified to Australian Standard 1221. 4.5kg, 6kg & 9kg cylinders all have a thick skirt at the bottom. 4.5kg & 9kg Cylinder fits into all standard sized vehicle brackets. 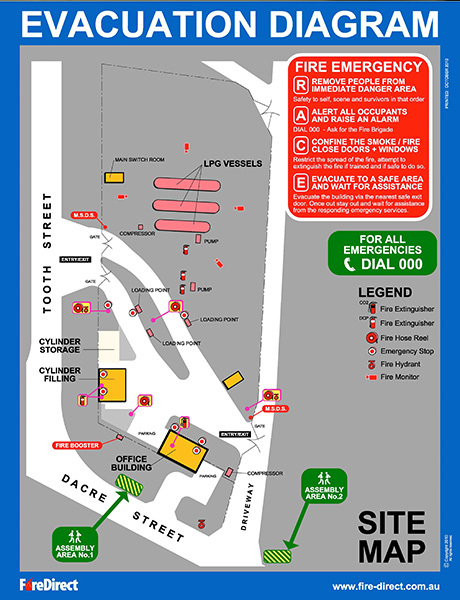 Site Safety Diagrams and direction signage diagrams are commonly used in large scale public spaces to locate various tenancies, occupancies, facilities and departments. Locality guides in shopping centres, hospitals, institutions, government services and large complex buildings are examples of public spaces utlising way signage diagrams to inform their occupants of location as well as traffic flow and accessibility. The development of emergency response procedures for inclusion in an emergency plan is not complete unless consideration is given to the occupants and visitors of a facility who may require assistance or are likely to experience difficulty in responding to an emergency and therefore require their own personal emergency evacuation plan. who easily experience extreme confusion in an emergency. AS 3745 also recommends that a list of the names of those occupants with a disability requiring a personal emergency evacuation plan be held at the location from where the chief warden operates in an emergency. Furthermore, suitable emergency and evacuation strategies in the emergency plan should be discussed with those occupants for which a Personal Emergency Evacuation Plan (PEEP) has been developed. In accordance with AS 3745, an emergency plan is required to document the emergency arrangements for a facility and detail preparedness, prevention and response activities. AS 3745 includes emergency roles, responsibilities, strategies, systems and arrangements. A facility's emergency planning committee in association with the facility owners, managers, occupiers and employers are responsible for deciding which types of emergencies require specific emergency response procedures to be included in theemergency plan under AS 3745. Those required to participate in the implementation and maintenance of theemergency plan are nominated as the facility's emergency planning committee, emergency control organisation, management and nominated staff under AS 3745.